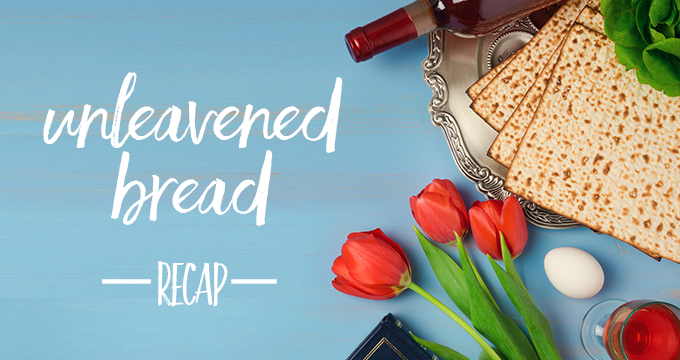 What other two holy days is the feast of unleavened bread associated with? What order do they fall in? Passover, Unleavened Bread, and Feast of First Fruits are all basically within the same week in that order. 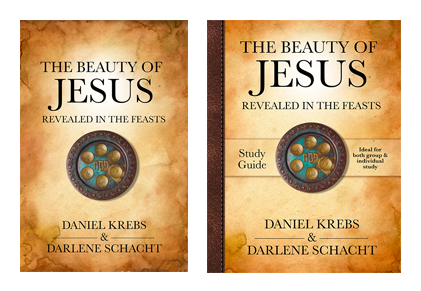 What three things is leaven compared to in the New Testament? What are the New Testament scriptures that compare leaven with sin? What is the Feast of Unleavened Bread also known as? And how long does it last? What do the words, “Bedikat Chametz” mean? It teaches us to search our hearts to ensure that we are keeping ourselves from sin and walking in the light of God’s word. Where the Passover is symbolic of Jesus’ Crucifixion, what is the festival of unleavened bread symbolic of? The death of Christ, and also believers dying to our sinful nature. In the Feast of Unleavened Bread, we are called to rid our homes of all things related to yeast. What does this symbolize for the believer’s life? What we’re seeing in the Feast of Unleavened Bread is the death of our spiritual nature. It’s no wonder this feast is intertwined with Passover in the wonderful way that it is, as we must crucify the flesh in order to walk in the spirit. We are dead to sin and have put that sinful past behind us to walk in newness of life. The Bible tells us that when we confess our sins, He is faithful and just to forgive us. We are free from the sin we once served. How is the Exodus from Egypt symbolic of a Christian’s life? The Exodus was a foreshadow of salvation. In the same way that they were slaves to Pharaoh we too were slaves to our sin. And so we see the sinful nature at war with the Spirit of God as Moses is saying to Pharaoh, “Let my people go.” Of course, Pharaoh isn’t letting them go without a fight, and neither is Satan eager to let us go. What are the two natures that Paul speaks about in Galatians 5:17-18 that war against each other? The flesh and the spirit are at war with one another, and so we must bring our flesh under subjection to the Spirit. Why was Jesus angry at the Temple? Because the Jews were buying and selling in “The Court of the Gentiles.” This was a spot that was provided for any Gentiles who wanted to worship God. What they were basically doing was pushing the Gentiles out of the temple by setting up their tables there. Another reason Jesus was angry was because the money changers would often short-change those who were trading Roman currency for temple coins. When did the cleansing of the Temple take place? The gospels tell us that Jesus cleansed the temple on two different occasions—once at the beginning of His ministry just after He turned the water into wine, and again three years later at the end of his ministry, one week before He was crucified. On both occasions, He cleansed the temple on the week before Passover, which was the time of preparation for the coming feast. According to the Talmud, who was born on Passover? There’s a long-standing Jewish tradition and in fact, the Talmud (Rosh Hashanah 11a) says that Isaac was born on Passover. We talk about this in the book, and how if this is indeed a fact, the timing is incredible. Why would Lot serve them bread without yeast? We know that the Feast of Unleavened Bread wasn’t implemented until the Israelites left Egypt, but could it be that this was a foreshadow of the coming Messiah, even then? What happened 430 years prior? I was curious so I dug deeper. I wondered, was that the day that Joseph’s brothers came to Egypt? Was it the same day that they were taken into slavery? What happened 430 years before? I found the answer in Galatians. 430 years earlier, to the very day, the promise was made to Abraham. And so we see that this promise was given to Abraham at the time of the Passover. How incredible is that? I had always thought that they were slaves in Egypt for the entire 430 years, but I noticed that Moses’ grandfather Kohath (son of Levi) was already born at the time that the Israelites entered Egypt with Joseph (Genesis 46:11). Everything about the birth of Isaac keeps pointing back to the Passover. It makes me wonder if perhaps there’s a reason God put it there. From what I have seen in the Word, there’s always a reason God puts things where He does. What is Isaac’s circumcision on the eighth day symbolic of? What do the two sons of Abraham, Isaac the son of Sarah and Ishmael the son of Hagar each symbolize? One was born of the flesh and the other born of the promise. This represents our old life before Christ and our new life in Christ. One is a slave and one is a free woman just as we were once slaves to our sin, but now we have freedom in Christ. In Galatians 4:30-31 Paul writes, “Get rid of the slave woman and her son…” What point is Paul trying to bring across in this verse? Hagar represents the sinful flesh of man, while Sarah represents life in the Spirit. There’s no room for both in our life. We either serve God or we serve sin, which is why those who worship God crucify the flesh daily. According to 1 Corinthians 5:8, what is the “unleavened bread” of the new covenant symbolic of in the Christian life? How is the matzah bread used during the Passover meal symbolic of Isaiah 53:5? If you look at a piece of Matzah, you’ll notice how it’s pierced, and it’s bruised, and it’s striped. In the same way that Jesus was bruised for our iniquities and wounded for our transgressions, this cracker is wounded and bruised to remind us of the cost of redemption, and how by His stripes we are healed. Where can I find your notes for chapter one.